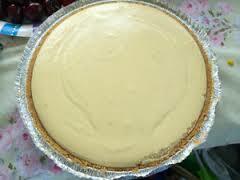 Sweet Crust: A unique sweet crust recipe that tastes a bit like a key lime cheesecake. Cream butter and sugar. Add egg yolk and beat in thoroughly (reserve white for filling). Add flour and knead; adding first 1 tablespoon ice water, then a teaspoon at a time, until crust is elastic and can be formed into a ball. Refrigerate crust for 1 hour. Roll crust out and line an 8-inch pie pan. Make sure sides are turned over the lip of pan for support. Because of the butter content, crust tends to soften and slide down during baking if not securely supported. Bake crust about 20 minutes, until crust is set and just begins to turn color. Makes enough for two 8-inch pie crusts. KEY LIME FILLING: Makes a very cheese cake like filling. Beat the 3 egg whites from the separated eggs until fluffy, but not stiff. Stir egg yolks to a uniform consistency; do not beat. Add condensed milk and blend. Add lime juice and stir until completely blended. Fold in beaten egg whites being careful not to deflate the mixture. Pour filling into baked pie crust. Bake in oven until filling is just set, but not too firm: approximately 20 minutes.